These pillows have quilted fronts with medium weight, white denim as the backing fabric. They are sturdy! The backs are made from quilting fabric "quilted" to the denim again, but with no batting. 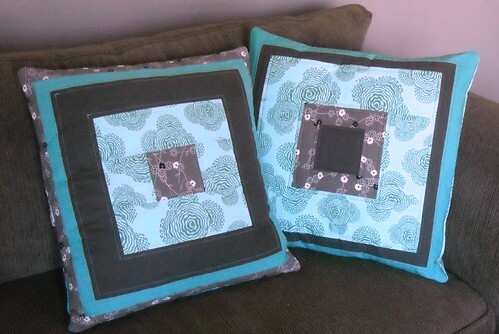 The overlap on the back is pretty wide, to prevent the back from gapping open and showing the pillow form inside. These were made to fit the pillows that came with my big chair here. I'm so glad this is done! Maybe next week I'll work on another of my older unfinished projects. 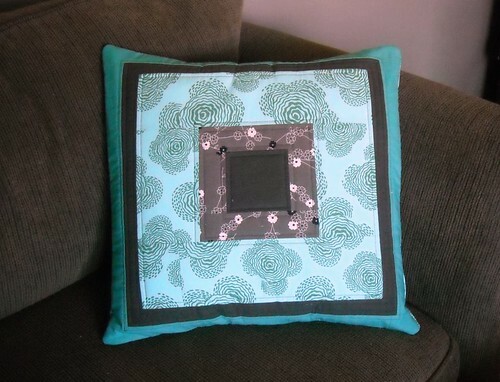 **head on over to amylouwho.com to see all the other Amy Butler sew & tell finishes this week! Glad you came to the party! Very pretty! I love the grays and blues...they look gorgeous together! OOH! LOVE it! And Love it with it's fraternal twin too! My fave color combo! Those colors are so pretty together, nice work! These really are great! Love the colors!